Angel Number 999 is very individualistic. When we come to a solid spiritual pinnacle, it’s as unique as your fingerprint. Your aura begins to resonate with kindness and a strong desire to lead by example. There is no question that Angel Number 999 brings out the best humanitarian attributes when you are working in this vibration. But, what else does this mystical number mean when it appears in your life? A second message from your Angels is about changes. Something is closing or ending while something else opens to you. The period in between these spaces feels a little empty and uncertain. Don’t let that sensation rule your head or your heart. The Angels are standing with you, welcoming whatever awaits on the other side of that door. Karma is playing a key role in the transitions ahead. It’s time to rely on your Angels for clarity and guidance. Triple number 999 reminds us of the power of self –love and keeping our eyes on our life’s spiritual goals. Often Angel Number 999 brings with it other symbols and omens. These act like qualifiers for your Angel’s messages. Keep your radar tuned up! 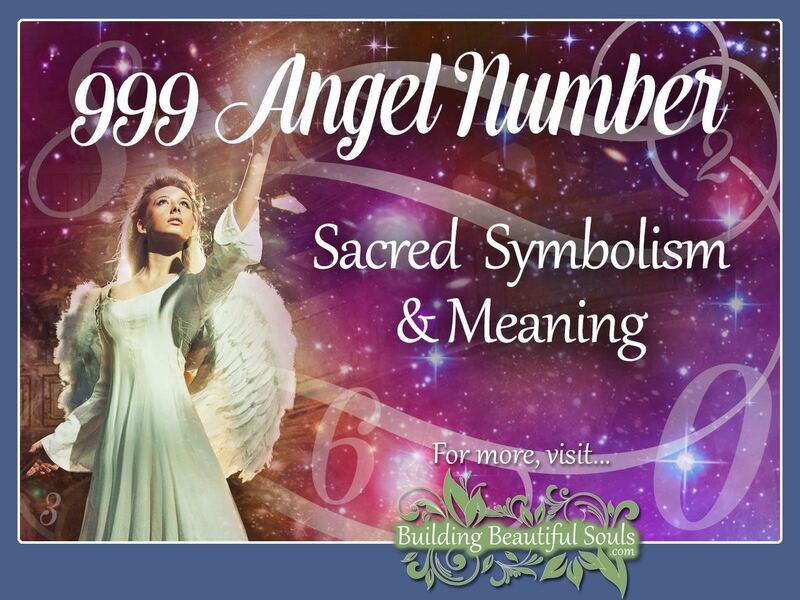 Light Workers tell us that when they see Angel Number 999, it’s a signal to put things into full throttle. Any efforts that assist and uplift humankind become a priority. This number also reminds us to think globally as our actions reverberate out from self and link into many other sacred energy networks. When your Angels bring the vibrations of 999 into your life, you will be challenged to express the true YOU in every situation. This is very challenging for most people. Why? Because we are used to putting on masks – there’s the parent mask, the professional mask, the “really I’m fine” mask, and so on. There are reasons for the roles we play in life. However, the authentic self should always shine brightly. Walk with integrity and intuition. Cooperate with your life’s purpose. Another meaning behind Angel Number 999 is that of releasing old thoughts and habits that no longer serve the real you. We all carry around burdens that would be best put down. While your past plays a part in who you are at this moment, it is not the ruler of this moment. Be here, now! Don’t let negativity and unhealthy behaviors hold you back. Now it should be noted that this counsel comes with much good news. You have been doing an amazing job in your life, creating symmetry, and elevating your vibrational level. The Angels and Master Teachers see this and are here to applaud those accomplishments. Talk about a magnificent choir to uplift your soul. Your life up to this moment has prepared you for everything to come. The Angels are presenting you with a gift toward the future complete with a bright, shimmering bow. The piercing question now, however, is how do you “wrap” everything up? Anything that you haven’t finished should be completed before taking this all-important next step. The new beginnings heralded by 999 can come with struggles. When you change as a person, sometimes the people in your circle also change. Others do not. That means the people currently remaining in your intimate sphere may slowly fade, while relationships with others deepen. The Angels support this by giving you the love and wisdom to transition as necessary for everyone’s betterment. Think of it this way: When you were growing up you had a gaggle of friends. Some of those friends remain to this day while others have gone a different Path. There was nothing wrong with those that left, it’s just that your vibrational level shifted. In life, there are many such situations, and they will continue evolving just as your spirit evolves. Throughout the time you’re working with 999 release yourself from those things you consider mistakes. Learn from them, then let them go. We cannot change the past, but we can build a better future with our Guardian Angels. Many people going through this experience discover a desperate need for quiet and rest. There is too much noise to clear your head adequately. Seek out that place that settles your soul so you can adjust your thoughts with hope in your heart. Remember the Angels know how you feel, and they will guard you against external chaos and advice, no matter how well-intended. Number 999 generates warm, welcoming energy. Those wishing to become more of a leader will find this vibration very encouraging. The Angels draw your attention to your potentials, and ultimately the revelations to come. It sounds dramatic, but Destiny is literally just around the corner. You will know it with certainty when you see it. It’s as if the Angels put a bright neon light saying, “HERE… HERE! Come on!” Do not be surprised if the opportunity comes in some form of a humanitarian project. This is personally satisfying while also being significant from a global perspective. Even small efforts in your proverbial back yard can manifest in profound ways. Again, you will be able to recognize that ripple effect. Think of yourself as a ball of yarn. When you interact with people in loving, caring ways, your yarn attaches to theirs – and to all the individuals they touch by extension. This is very exciting and empowering. Better still it often aligns itself with your true passions. When it comes to relationships and feelings, your intuitive ability is at an all-time high. You may have recently ended a cycle with one person or started something new. In either case, your emotions are a little topsy turvy. You can’t know everything about everyone, so right now 999 tells you to simply embrace that unknown. You’ll have greater understanding soon enough – whether it’s the reason for parting or the potentials in meeting. Your Angels and Guides are both working in your favor here. There is nothing like a little extra perspective from on “high.” They’re nudging you toward broadening your horizons so that you start unfolding that all-important soul contract as it intersects with the people in your life. Truth be told, if there is a bond you really want to be strengthened, you can have that wish. Just make very, very sure that it’s the “real deal” and not an illusion. Remember that Angels are very powerful, but they won’t push. They’re here as guides, not enforcers. Free will is liberating, but it comes with responsibilities that begin in your heart. In the art of Numerology, number 999 expresses the energies of kindness, giving, and understanding. While some of this energy is focused one-on-one, the greater portion has a Universal flavor. This number implies working for the greater good of all humankind, promoting the vision of the world as it can be when we all do our part spiritually, socially, and politically. There is some self-sacrifice rolled up in 999, but the rewards balance that out. In Biblical Numerology 999 corresponds to various verses. In Psalms we find, “the meek shall inherit the earth.” Consider the passages in Hoshea, “The door of hope,” and in Deuteronomy, the phrase is “for a sign and a wonder.” Putting this together we see Angel Number 999 embodying hope, the promise that we will have omens that guide our way. More importantly, 999 offers a lesson in the power of humility. When 999 continues coming into your awareness after you’ve already begun making changes, there is even more to the picture than you initially thought. Being a co-creator is a BIG concept, and as humans, we sometimes doubt our ability to make a difference. Angel Number 999 isn’t going to go away until you remain aware of your thought forms and the way they impact reality. You have the power for manifestation – you can be and do so much more than you imagine. Look around. There are so many little glimmering messages from the Angels that are aimed at inspiring you. Soak up that beautiful energy, tune up your area and get ready. You’ve got some work to do!